This book took me a while to read not because it wasn't good, but because it was the sort I could set down and pick up again when a moment arose. My goal was to finish it while Dr. Koop was still alive, and I believe I have done so. His was a name that was vaguely familiar to me, probably because my parents are smokers and I've seen the Surgeon General's warning since I was very young. 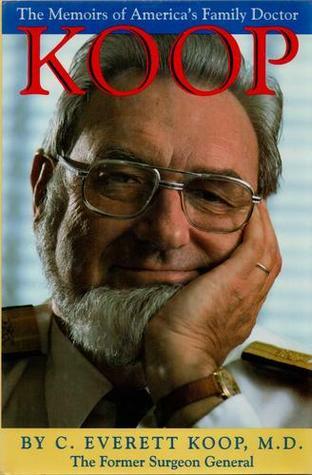 However, I was only 4 or 5 years old when Koop left office, so I have no real memory of him as our Surgeon General.What I liked best about this book was that he didn't focus solely on his time as Surgeon General, and instead recounted his career as a pediatric surgeon leading up to the appointment. While he will likely best be remembered as Surgeon General, his contributions to pediatric surgery are equally remarkable and formed the basis of some of the most controversial issues he faced as Surgeon General. Koop was one of the first surgeons to successfully separate conjoined twins, opened up a NICU in Philadelphia to care for premature babies, pioneered treatment for congenital defects in the digestive tract, and worked with many children whose complex medical problems had them deemed hopeless cases by other doctors. This section was my favorite part of the book because I had not realized how new the field of good pediatric care is to the world of medicine and as a woman who hopes to have children, it's reassuring to know Koop was out there laying the foundations of pediatric medicine.The political side of Koop's book was less interesting to me, though his stance on the major issues was of interest. I'm not a student of politics and this book was written about the Reagan presidency and early days of the George H.W. Bush presidency, but if all the political obstacles faced by Koop still exist, I can see why our government officials talk big but accomplish little. Koop seemed like a well-qualified candidate for Surgeon General, but considered too old for the job (thus the reason I thought he might be deceased or soon deceased, as he's now in his late 90s), and it took months to get the rule changed to accept him. Throughout the book, it seemed like every time he wanted to put out a report on one of his 4 major platforms (AIDS, anti-smoking, abortion, or treatment of ill babies), others in the government opposed and rewrote it until the message was not necessarily what Koop wanted to say. Even those who shared Koop's views on these issues seemed to oppose him, which boggled me. While I didn't always agree with his views, I felt he had good points, especially in terms of AIDS, which was just emerging as a threat during his tenure but about which the government wanted to do little.Overall an enjoyable book, and definitely worth the read, because although it is dated, Koop's first-hand account of both pediatric surgery development and the political landscape of the 80s when it came to medical issues is unique, and no Surgeon General since has made as notable an impact in or out of the political spotlight. I loved this book. This man has every reason to think he's better than everyone else and his book just shows humility all the way through it. It was awesome to read about a book by a born again Christian who doesn't preach. He tells about how his faith drove his decisions, but not in a holier than thou way. In the beginning, he tells about starting the first hospital pediatric - really more infant - surgery department in the country. His wife certainly stood by him during some hard times. This is a book I would highly recommend. I was drawn to the fact that Koop was skewered by both the "left" AND the "right." Koop took a tremendous beating from conservatives for his stance on distributing condoms. I also was very touched by the personal tragedies that he faced. Very highly recommend for anyone who enjoys biographies; an enjoyable and insightful read regardless of where you are on the political spectrum. This is a really enjoyable read. Fascinating look into what makes a surgeon tick and the ethical issues involved in medecine. A very excellent book. I highly recommend it.